2 Bedrooms, 2 Bathrooms, Sleeps 5. This beautiful self-catering apartment, is just two minutes walk from the center of Wexford Town, in the Sunny South East of Ireland. Hollyville Heights is a quiet cul de sac, with allocated parking. The apartment is on the ground floor and is tastefully decorated to a very high standard. It has been awarded four stars by Ireland's Tourist Board. It has all modern conveniences including washer/dryer, dishwasher, Smart TV, CD/Radio, microwave, fridge, freezer, wireless broadband, multi-fuel stove, with a supply of fuel, and storage heating. Wooden flooring throughout giving low allergen environment. There is a patio door leading to a private garden area, where you can dine al-fresco on the deck! The master bedroom has a double bed and is en-suite, while the second bedroom has 2 single beds or a double, if required . A cot, high chair & a folding bed are available on request.There is also a separate bathroom with power shower. A car parking space, at the front door, is provided free of charge. Clayton Whites Hotel leisure center and pool is just three minutes walk from the apartment. Guests can book and pay for time in the leisure center, directly with the Hotel. There are in excess of twenty coaches from Dublin Airport to Wexford each day. Located in a quiet cul-de-sac just about five minutes from the center of town. Storage heating and solid fuel stove in the living/dining area. Timed heating in the bedrooms. Free parking space, for one car, at the front door. Extra parking can be arranged in advance. The apartment has wooden flooring throughout with the exception of the kitchen and bathrooms which have ceramic tiling, this together with appropriate duvets and pillows etc. lend to a low allergen environment. It is situated in a small, safe and secure residential 'cul de sac' development located just three minutes walk from the town centre and close to all amenities . As this is a ground floor apartment, it is suitable for all age groups. A cot & high chair can be provided on request. The car space is situated conveniently at the front door. While storage heating is provided Guests can also enjoy the warm glow of a solid fuel stove. The patio garden enjoys many hours of sunshine for most of the year and accommodates a fresh herb garden for Guests` use. Guests would preferably refrain from smoking in the premises. Electricity is extra. Wi Fi is available. Paddy was an incredibly gracious host. The accommodations he provided were not only clean and spacious, but close to Wexford city center as well. The WiFi was finicky at times, but Paddy himself showed up to fix it after we expressed it was giving us troubles. I can not recommend this accommodation and host enough. Wexford itself is a great little town. It has tons of shopping in city center and a large number of fantastic restaurants. If you aren’t from Ireland or somewhere like it, you’ll find even the cheap food is incredible, fresh, and for the most part organically sourced from the rural Irish countryside. Also, the Guinness actually does taste better in Ireland, in my opinion. What a brilliant place to stay. All the home comforts in one place . Really handy for the town center. I will be telling anybody who is thinking of visiting this fine town this is the place to stay. Thanks for the welcoming gift and the coffee on departure we had a whale of a time we are thinking of coming back soon so expect us again.. Thank you once again for a great place to stay Ian,Jude ,Charlie & Christine. Quiet, excellent location, genial host!!! The apartment, located in a quiet "subdivision" yet only 5 minutes walk from the Quay. So many extras provided by Paddy, you hardly needed to buy anything. And his suggestions for places to shop, places to visit - spot on! There is a lot to explore around Wexford, and this is the ideal base from which to do it, relaxing and homey. Thank you Jan & Ray for your kind comments. It is always invigorating when one receives positive feedback. We try to give what we would expect when we are guests. 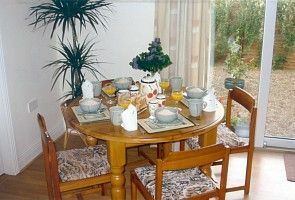 A lovely cosy property with all home comforts. Nothing was too much trouble and everything had been thought of. We received a warm welcome from Paddy and everyone we met was helpful and friendly. We would have loved to have stayed longer in this beautiful area. Thank you Elizabeth and family. It is encouraging, for me, when I receive such positive feedback. Enjoy your next vacation. The location was perfect. Close to the main street in Wexford town. Very well maintained. Plenty of supplies for cooking and cleaning. Paddy was easy to reach with any questions on how to use the appliances we were unfamiliar with. Definitely would recommend and would stay here on next visit to see our family. Thank you Jennifer for your kind comments. Looking forward to your return visit. The home was very clean and comfortable and in close proximity to everything. Wexford is situated in the 'sunny south east' of Ireland. It is a bustling Medieval town surrounded by many long sandy beeches - some extending to 7km. - happy days for walkers & water sport enthusiasts. Facilities, in abundance locally include:- Fine dining, country gardens, forest / country walks, equestrian facilities including horse racing, links & parkland golf courses, sea & shore angling. We also have The Irish National Heritage Park, Rosslare Ferry-port with direct sailings to the U K and France, Johnstown Castle gardens & Farm Museum, the Saltee Islands - home to thousands of sea birds including Puffins & Gannets (the largest sea bird in this part of Europe),A cruising restaurant on the three sisters rivers of Barrow Nore & Suir, Dunbrody replica Famine Ship, North Slob Wildfowl sanctuary - home to many species of migrant wildfowl including Whooper Swans, Geese & duck. Also, Hook Lighthouse - the oldest operational lighthouse in the World. Clayton White Hotel Leisure center and Thermal Suite - just a two minute walk from the apartment - is available for booking. This is a location to suit all needs. Weekend / midweek rates negotiable on request.